Eritreansk/Etiopisk afton med Hailu Mergia, Sofia Jernberg & Elena Wolay UTSÅLT! Jazz Är Farligt spelar skivor innan och efter konserten. 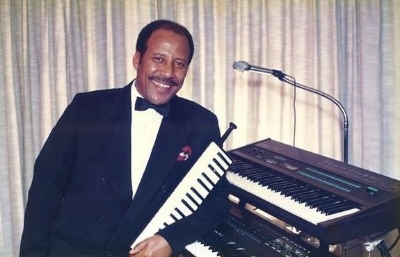 The keyboardist was a major star in 1970es Ethiopia, presiding over the country’s leading instrumental ensemble Walias Band, which worked restlessly on the Addis Ababa hotel circuit and jamming with luminaries like Duke Ellington and Manu Dibango. In 1981 a good part of Walias including Hailu used the first ever US tour of an Ethiopian music group to escape the dictatorial Mengistu regime. Since then Hailu has been a resident of the Washington DC area, spending most of his recent years as a cab driver at the capital’s Dulles Airport and playing only privately. Enter Brian Shimkovitz, operator of the acclaimed blog-turned-record label Awesome Tapes From Africa, who came across “Hailu Mergia & His Classical Instrument”, a somehow obscure 1985 cassette, in a music store in Ethiopia, tracked down the old maestro and reissued it: This charming tape has both a nostalgic feel (in its attempt to revive the accordion, once East Africa’s leading instrument before electrified “western” rock style instrumentation took over) as well as a futuristic dimension (recorded by the exiled Hailu all by himself in multi-track it features a host of synthesizers and drum machines). On the back of Shimkovitz’ reissue of “Classical Instrument” (which came out June 25 2013), Hailu started to play live again – in the US with the New York based Afrobeat band Low Mentality and in Europe with a hard-to-beat rhythm section made up from two leading Australian improvisors living in Berlin: Tony Buck (drums) and Mike Majkowski (bass). In May 2015 he will play a very few selected shows with Swedish-Ethiopian soprano Sofia Jernberg. Sofia Jernberg (who was born 1983 in Ethiopia) is a Swedish soprano, voice-artist, improviser and composer. Between 2002 and 2004, Jernberg studied jazz at Fridhems Folk High School. Later she studied for Per Mårtensson and Henrik Strindberg at The Gotland School of Music Composition. In 2008, she received the Royal Swedish Academy of Music’s jazz award. Jernberg is the leader (together with the pianist Cecilia Persson) of the chamber jazz group Paavo and is also one of three featured singers in Mats Gustafsson’s Fire! Orchestra. Jernberg is also working on the contemporary classical music scene, in which she serves as both singer and composer.